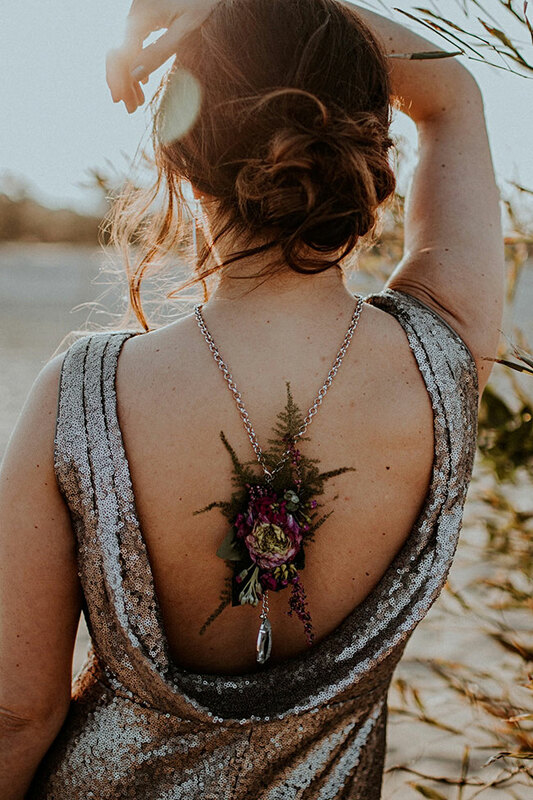 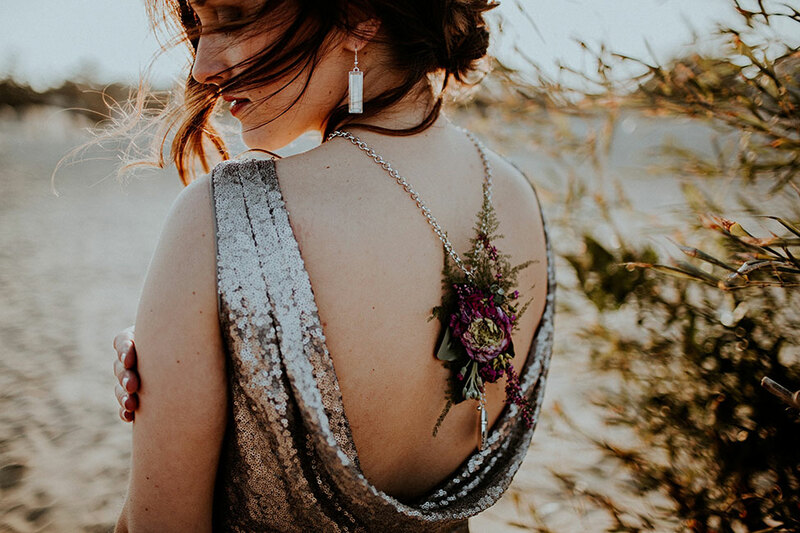 Never one to shy away from a more moody take on a wedding, I was utterly thrilled when this little jewel tone beach wedding inspiration came my way! 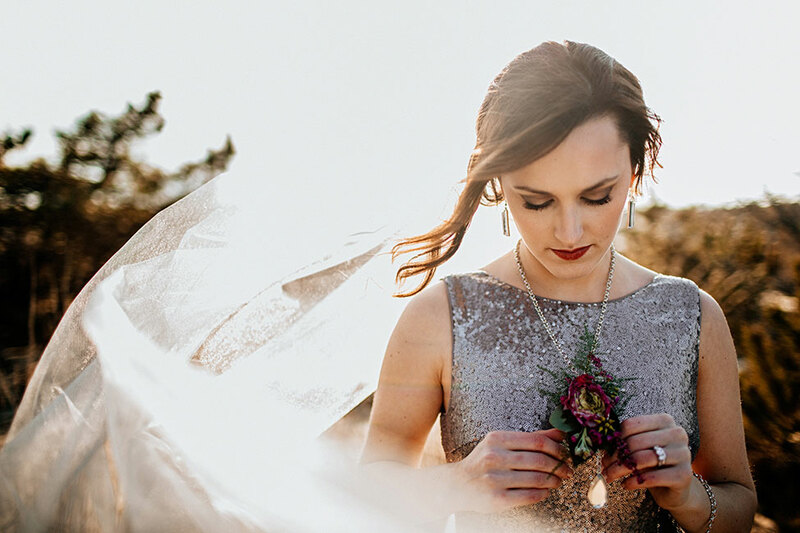 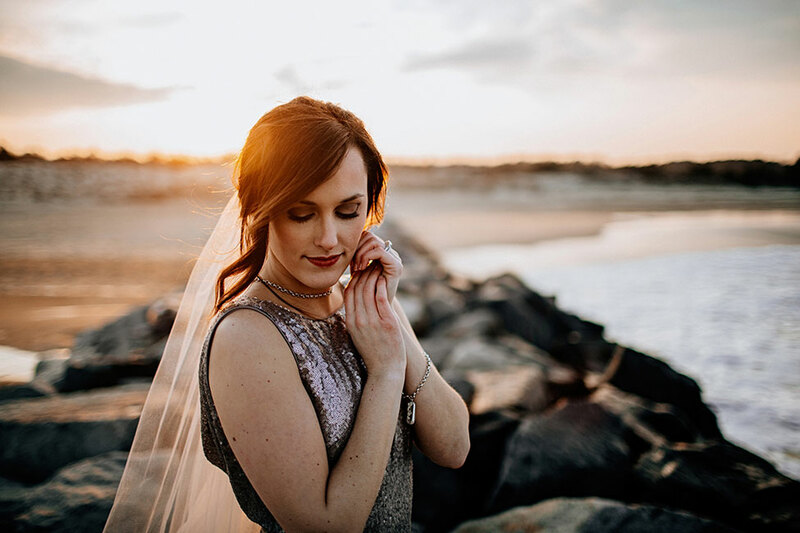 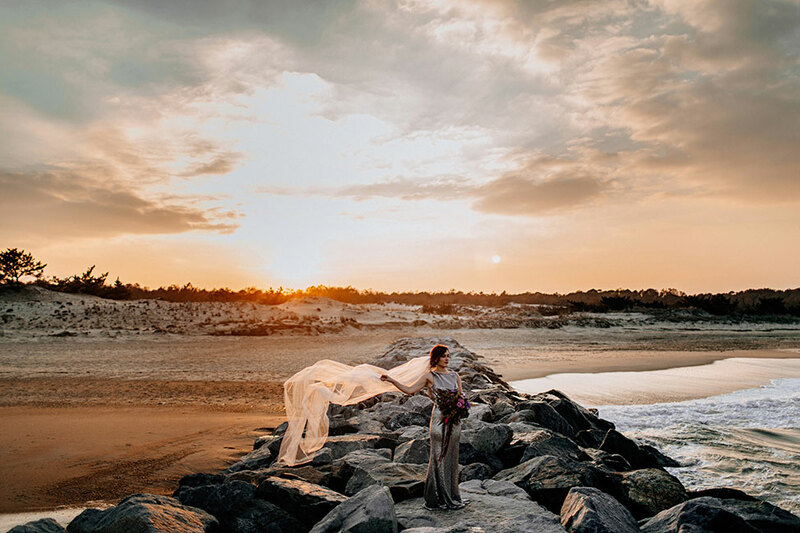 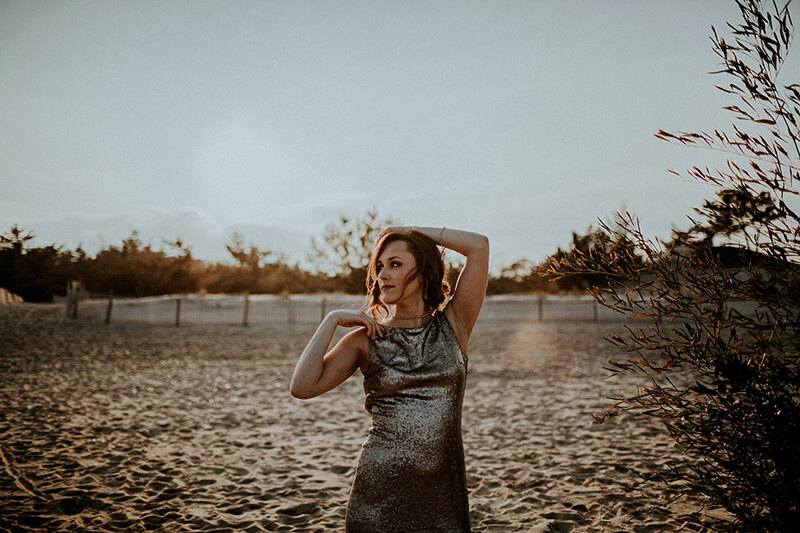 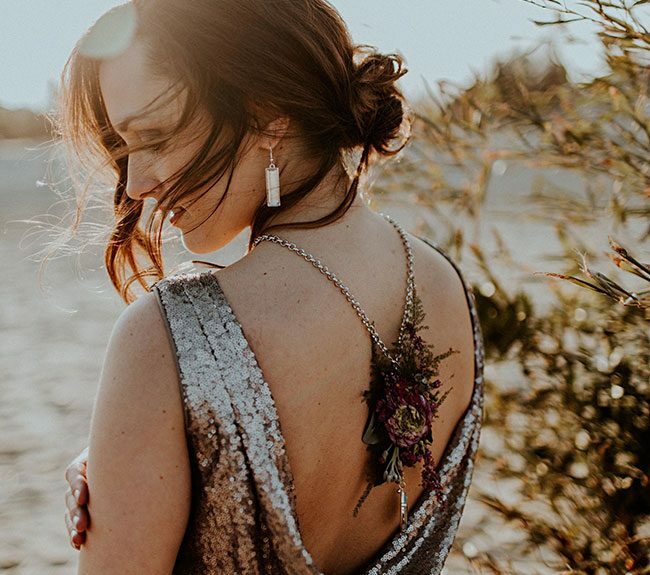 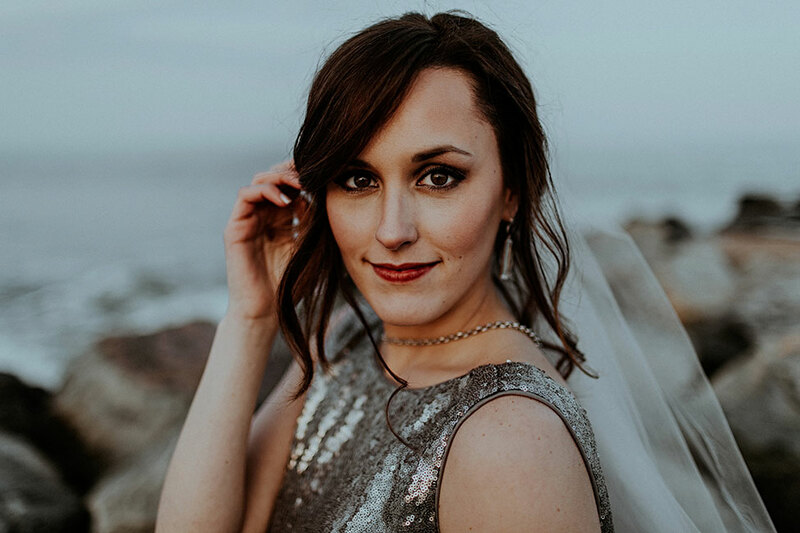 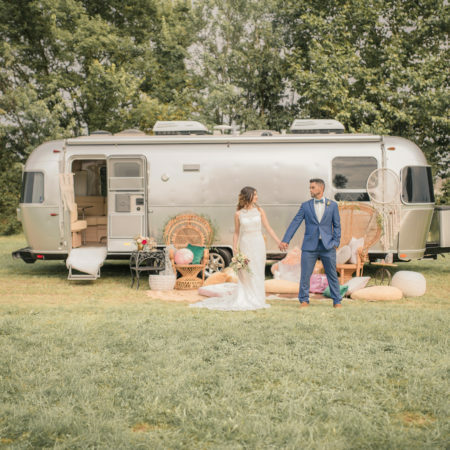 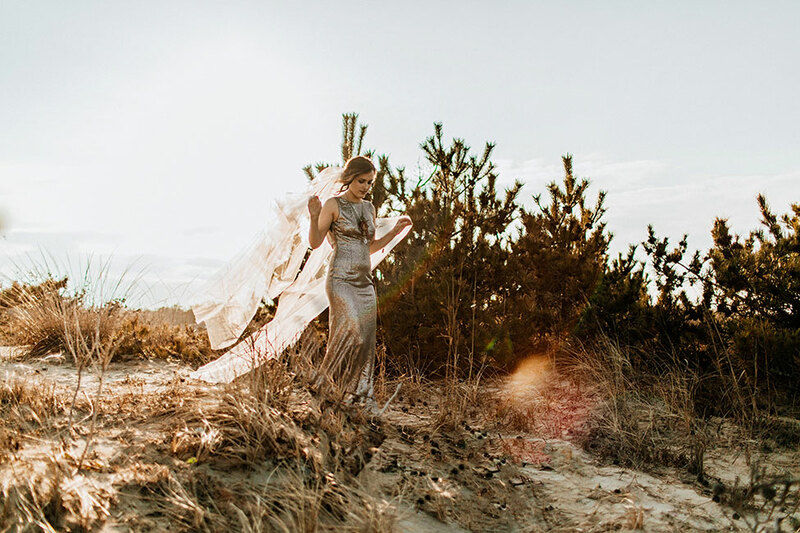 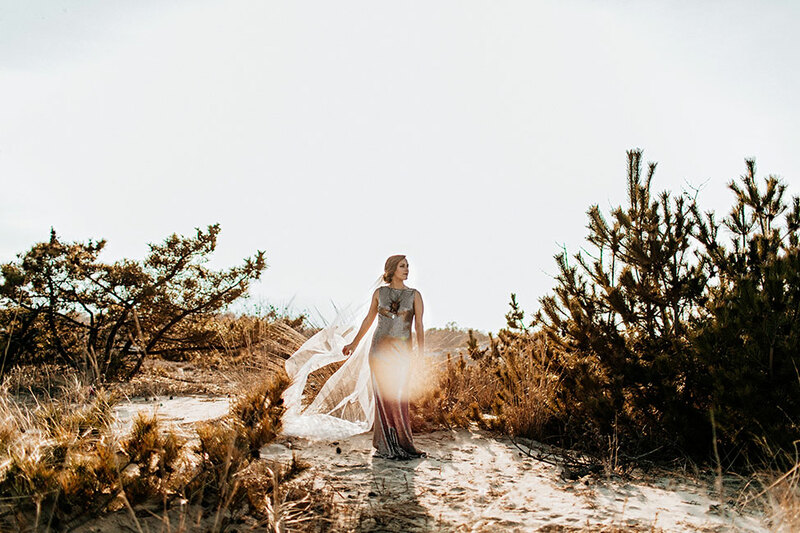 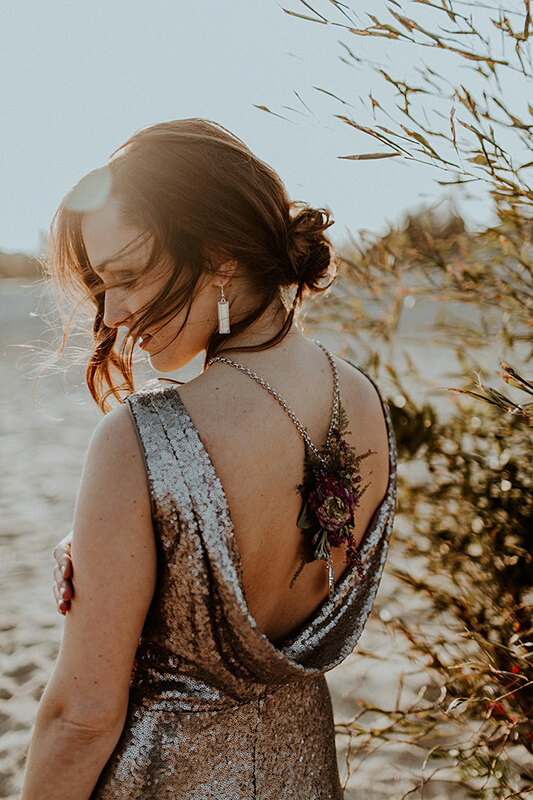 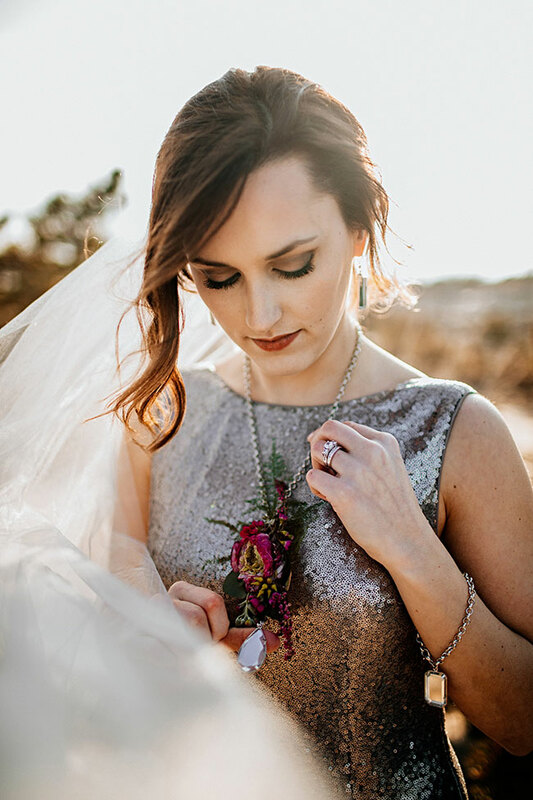 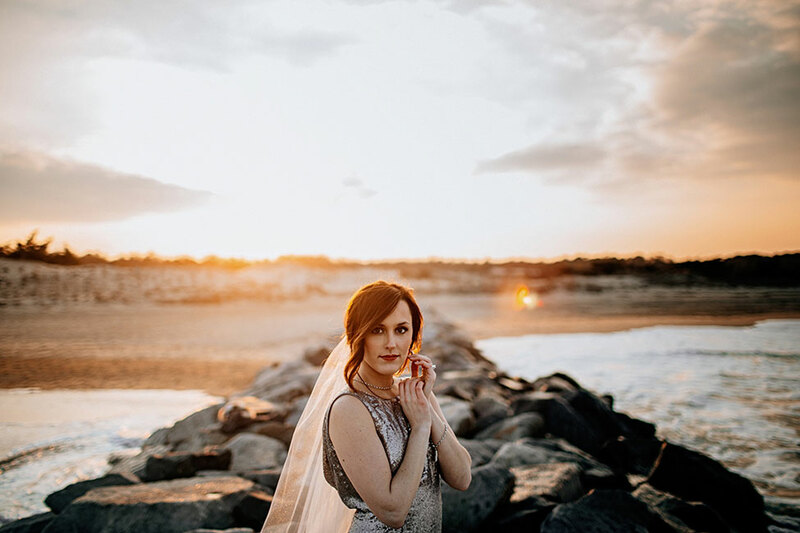 Wrapped up in the perfectly dark and glamorous photographic eye of Pennsylvania wedding photographer The Hursts & Co., the Delaware seaside locale of Cape Henlopen State Park comes alive just as the sun begins to set. 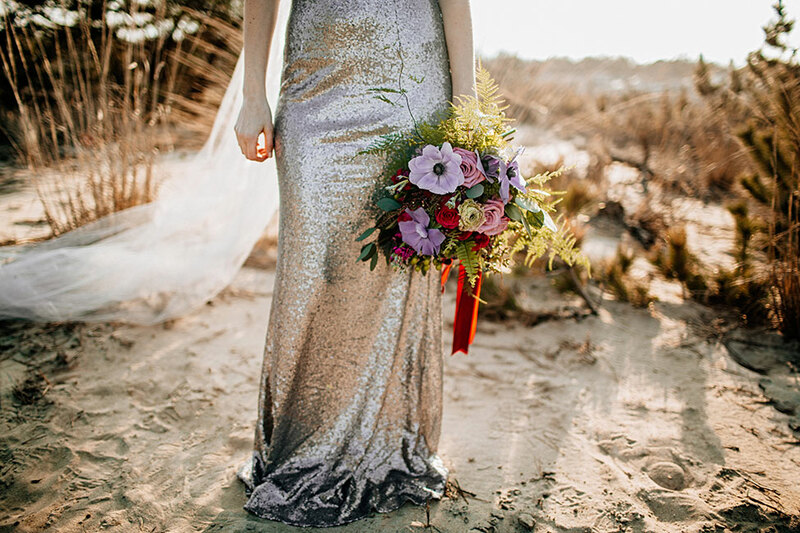 Inspired by the choice to play outside the currently favored blush & ivory color palettes, the mixture of moody jewel tones were elegantly paired with the sparkle of metallic. 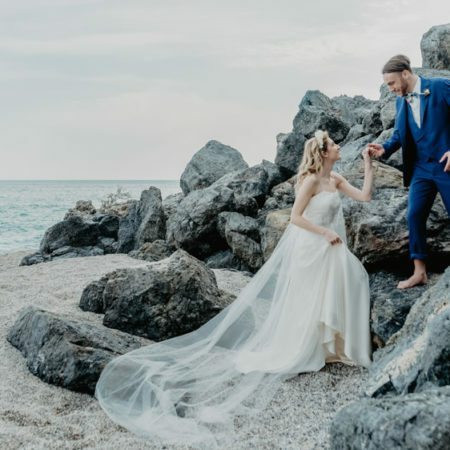 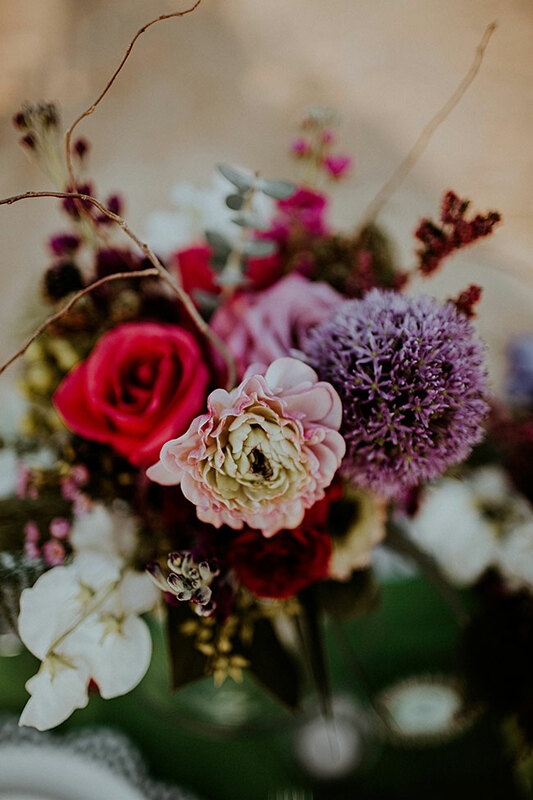 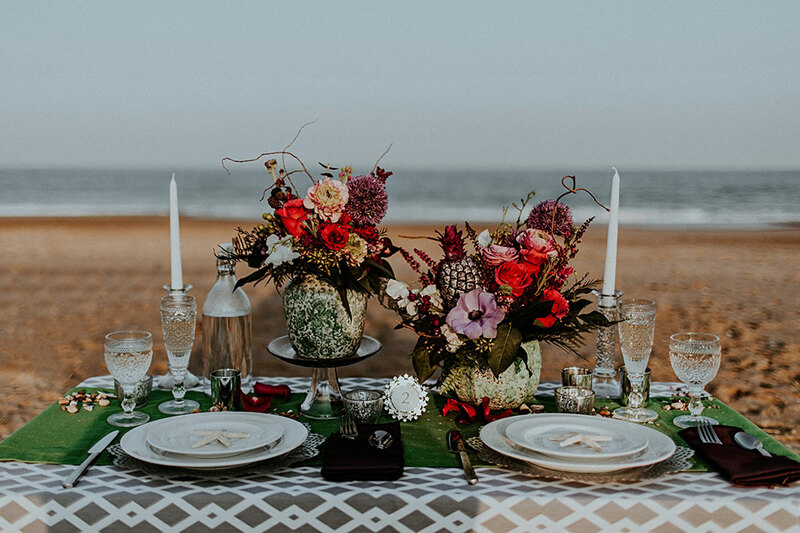 To dial up the drama of this beach wedding in the most deliciously glamorous of ways, florist Little Miss Lovely worked with a mixture blooms that not only toyed with the jewel infused color palette, but injected just the right textural touches. 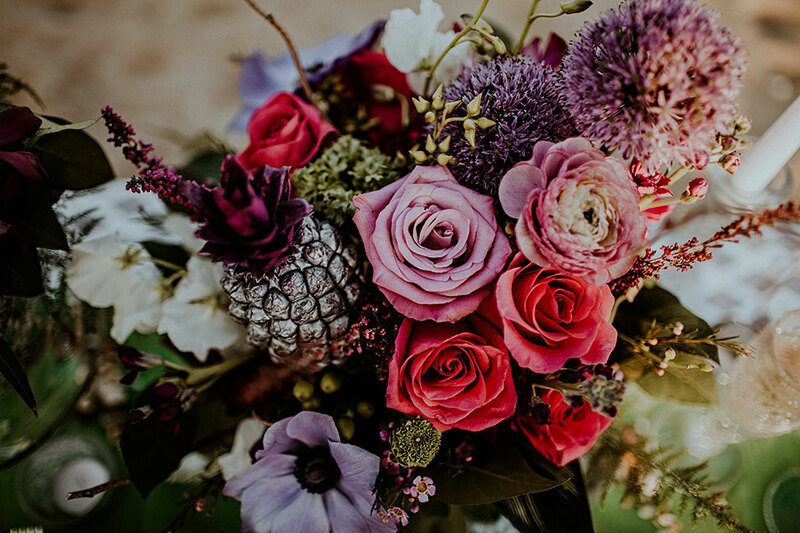 A wild and free hand tied bouquet was only the start to the floral decor, while cascading arrangements were put together in Anthropologie vases that allowed the blooms to spill out in a natural way. 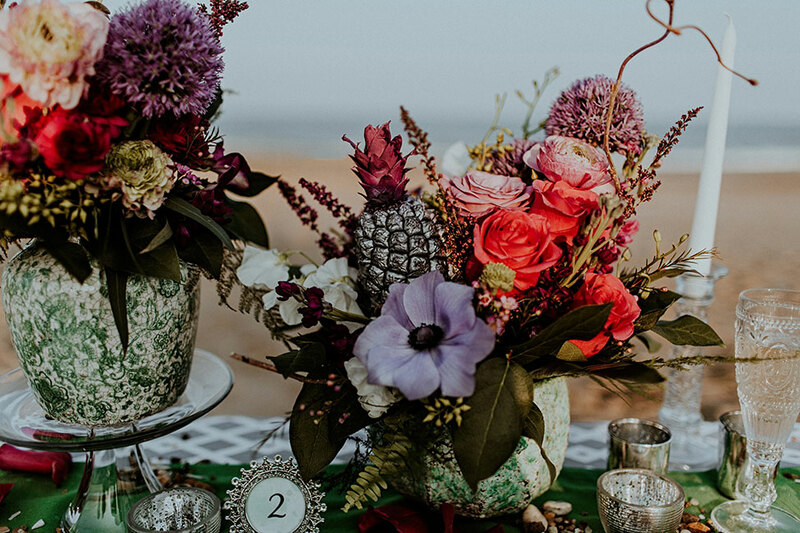 The seaside table offered cushy pillow seating in lieu of more structured chairs, while the patterned Kate Spade linens allowed the metallic tin chargers to pop, each detail echoing the bride’s glamorous metallic wedding dress bridal style. 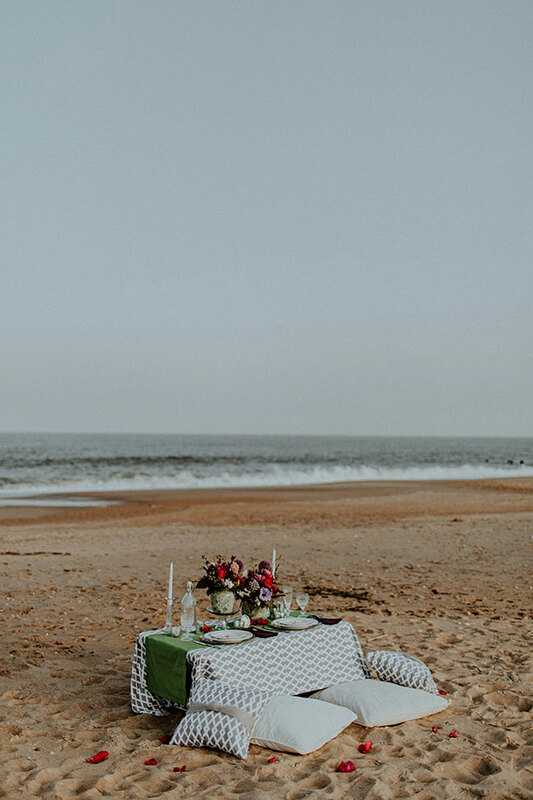 It is such a refreshing treat to see beach wedding inspiration that dials up the drama! 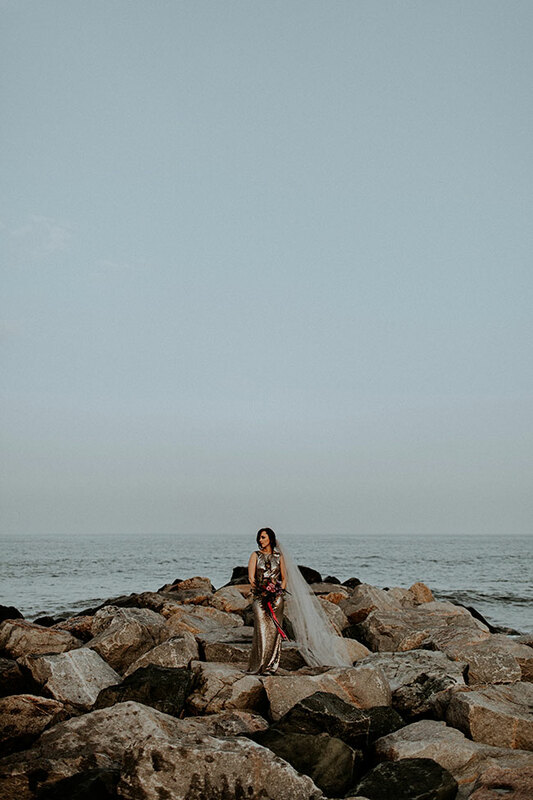 A coastal wedding can be many many things, don’t ever be afraid to let dark and moody be one of them! 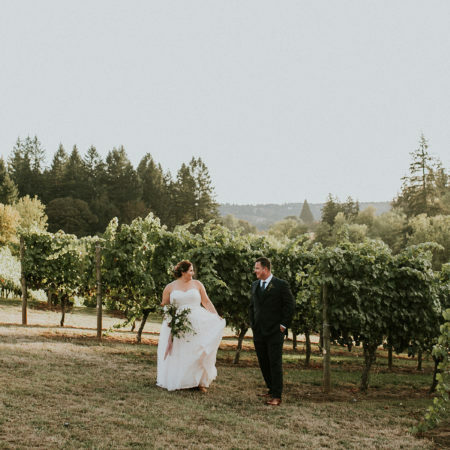 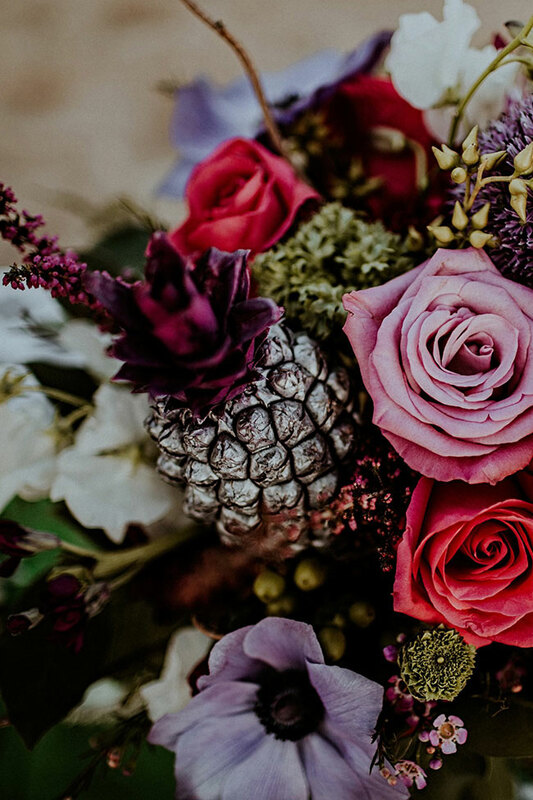 With so many weddings following a color scheme of blush, ivory and beige a wedding filled with glamorous, moody, dark jewel-tones and sparkle can make any bride feel inspired. 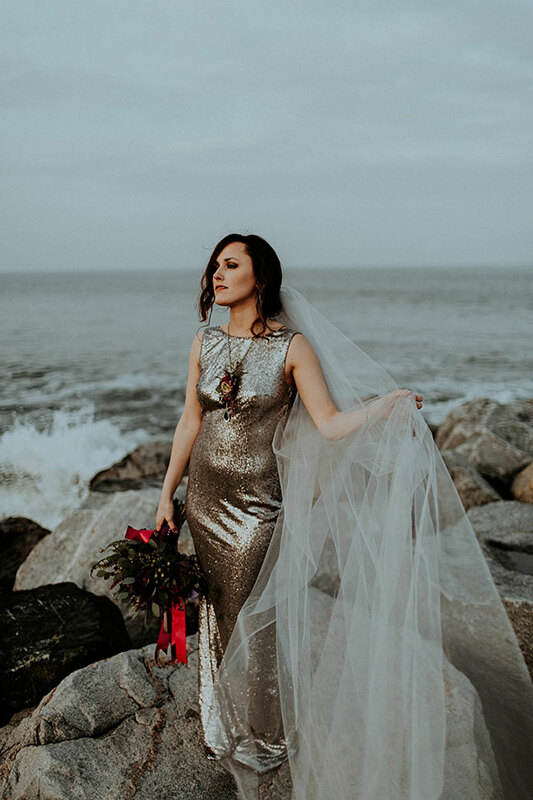 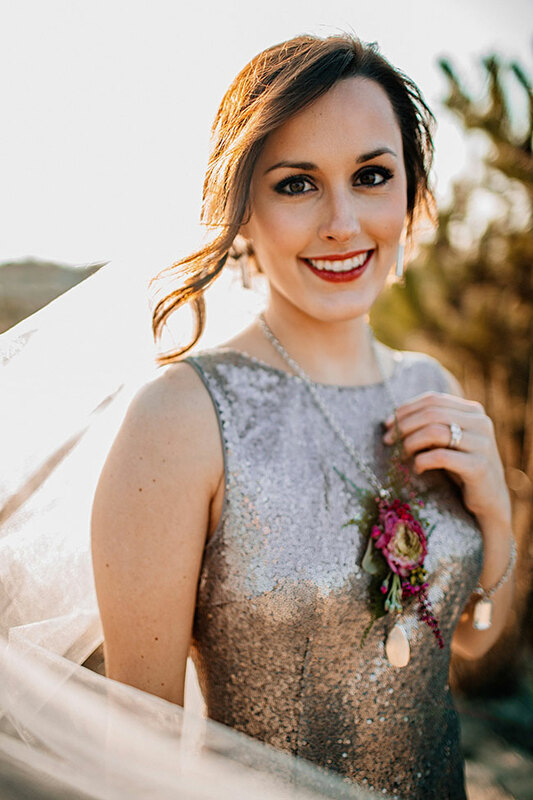 Bold, rich hues and shiny sequins are totally on trend right now.While planning this styled shoot we wanted to incorporate jewel-toned colors paired with sparkle in a natural, outdoor setting. 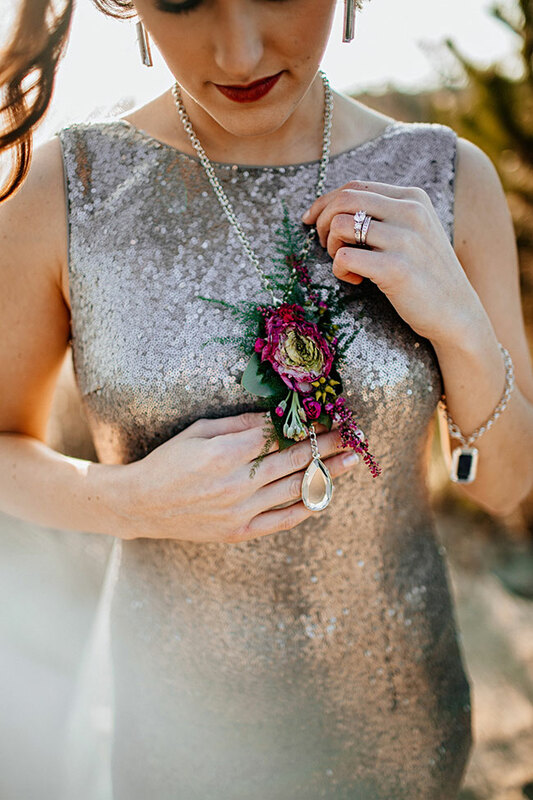 Organic, garden-inspired florals were paired with a glitzy silver sequin gown and oversized crystal jewelry. 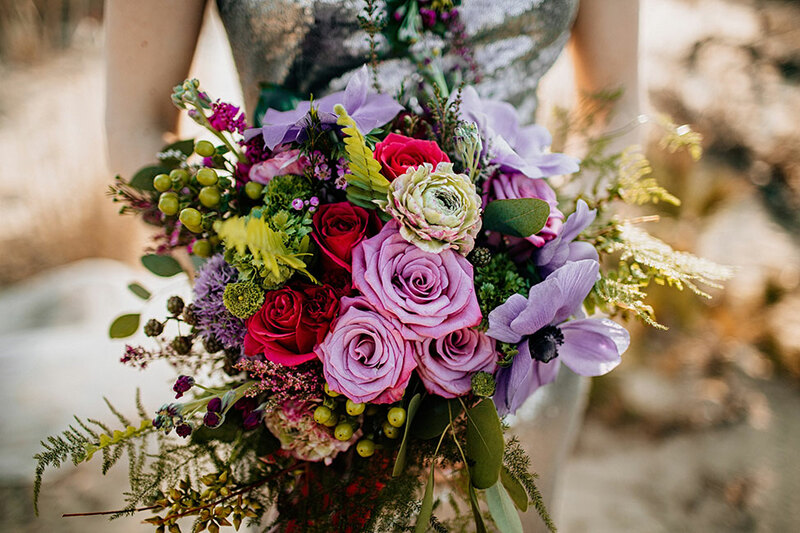 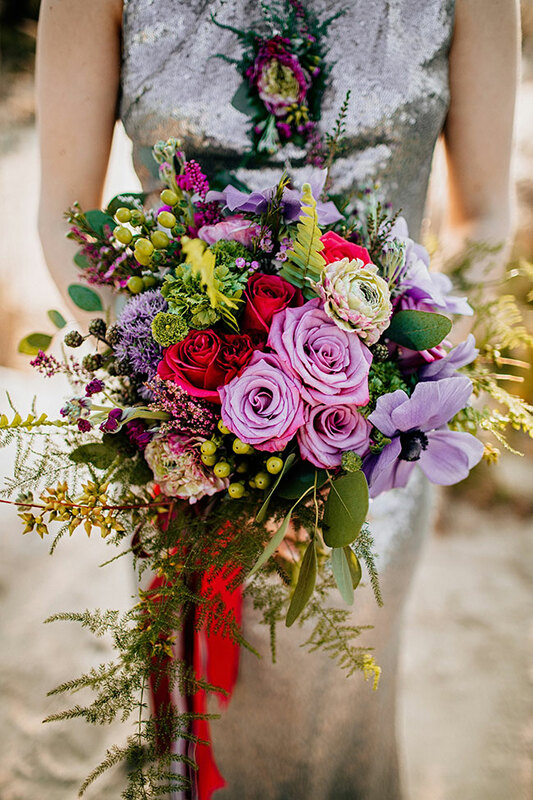 The bright colors and metallic accents looks stunning in a natural, beach atmosphere.A hand-tied bouquet was made with hot pink roses, dusty purple roses, striking purple anemones, fuchsia ranunculus, lime green hypericum berries, and other jewel tone florals. 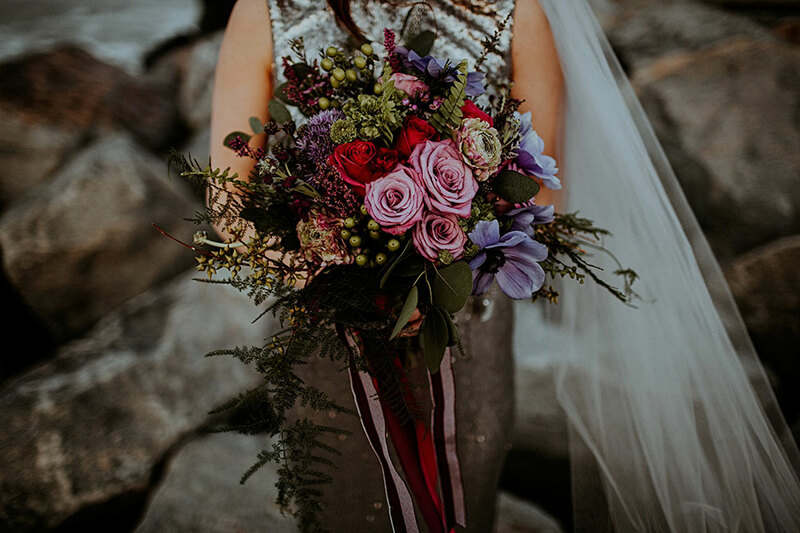 Long satin ribbons in coordinating colors stood out against the bride’s gown and the background.The bouquet coordinated with free form centerpieces that showcases local blooms arranged in an organic manner. 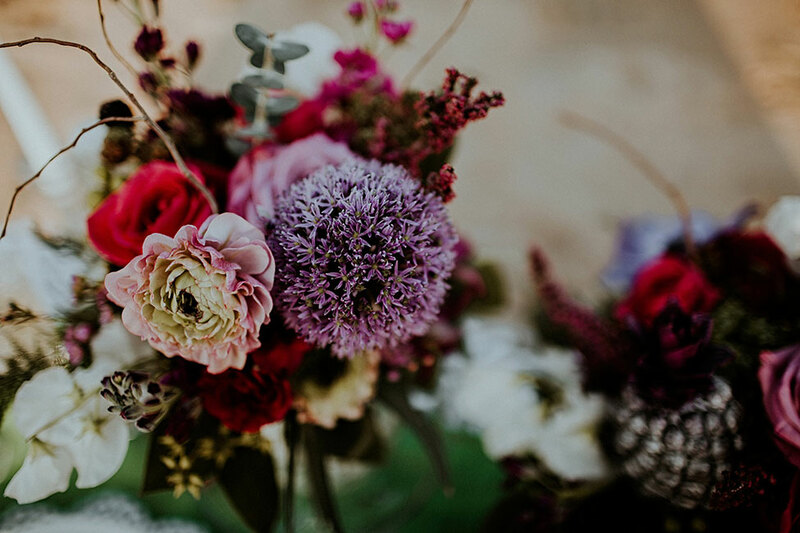 Cascading outward and reaching upward from their ceramic Anthropologie vases, the blooms looked just how nature had intended. 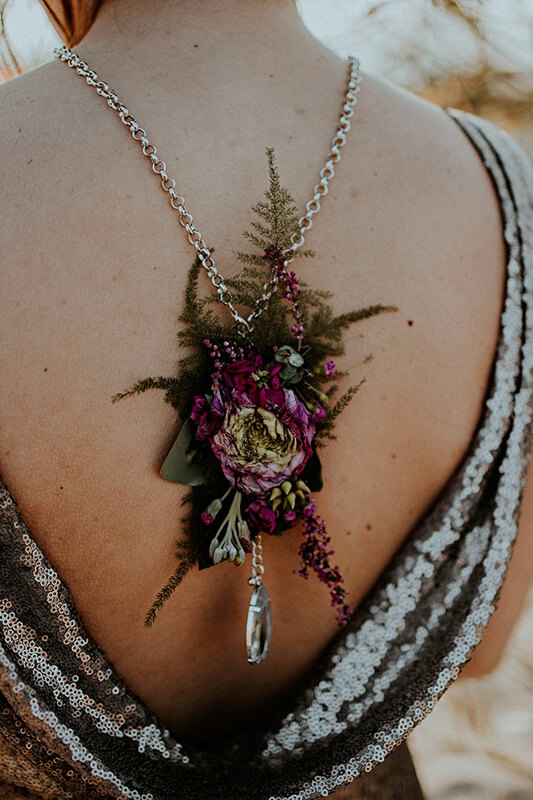 Textural greenery, herbs, and grasses were mixed into the florals to add a whimsical feel.The silver sequin gown was backless. 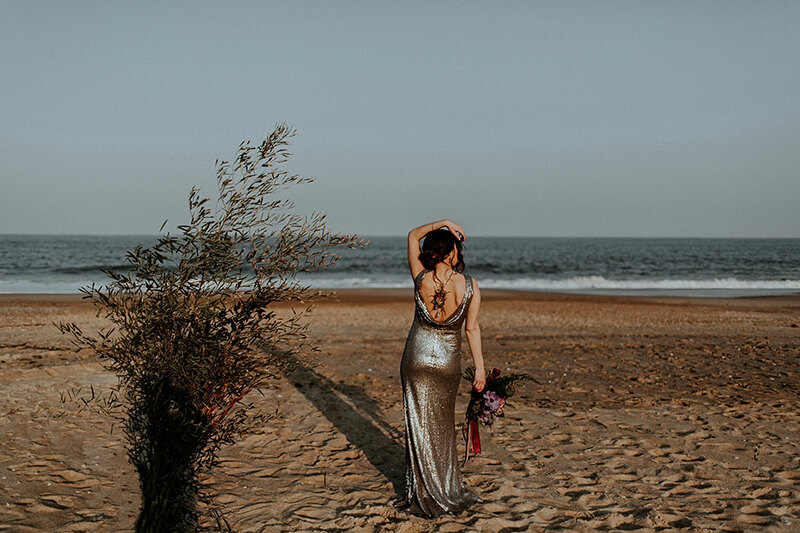 A 12-foot silver veil paired perfectly with a backless gown. 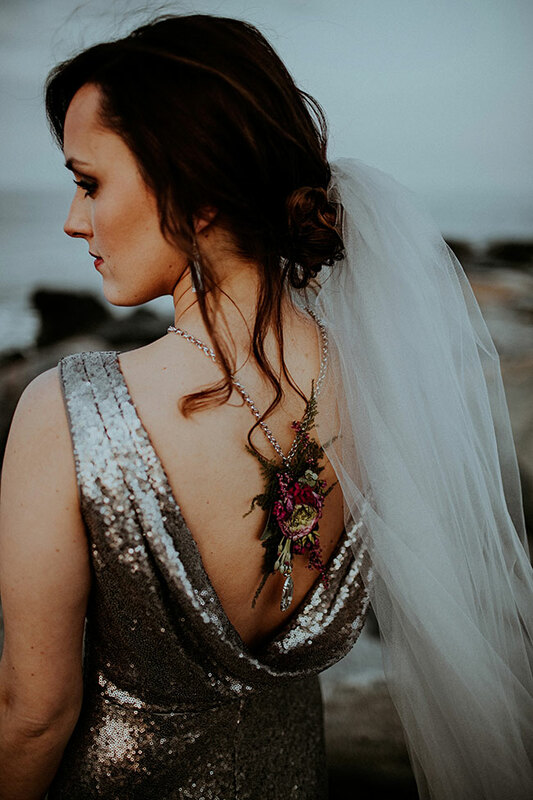 Also to accent the back of the gown, the bride wore a floral necklace that coordinated with her crystal jewelry. 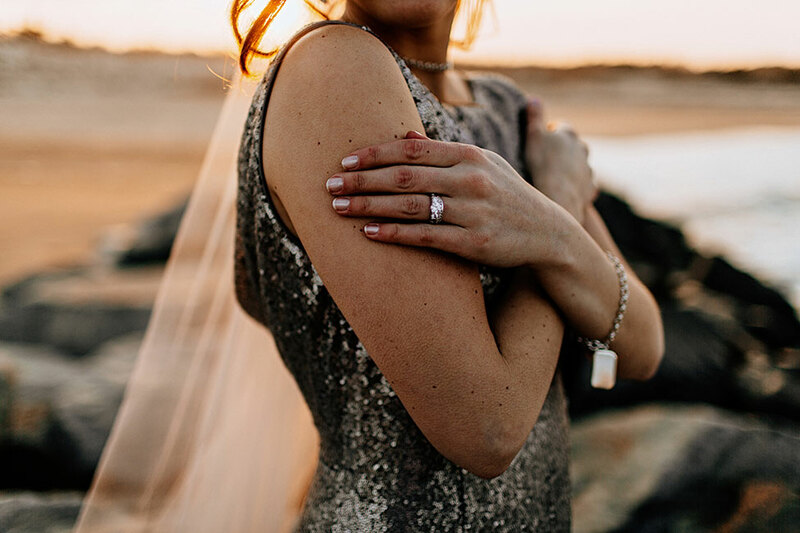 The costume jewelry was created to be bold and sparkly, just like the bride’s Bamoer engagement ring and wedding band.The silver metallic gown looked stunning on the bride as she stood atop and ocean-side sand dune that towered over the shore, her veil blowing gracefully in the wind.A small table was placed in the sand on the beach. 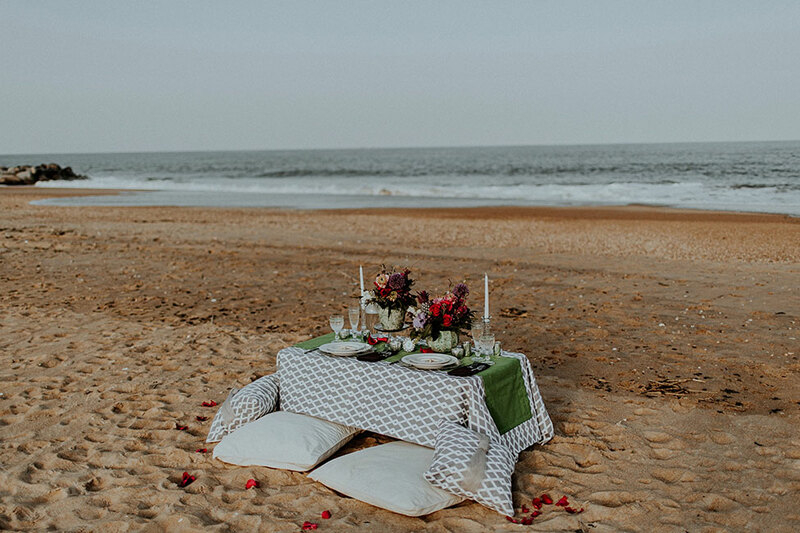 Sitting low to the ground, the table was surrounded by pillows that complimented the Kate Spade table linens. 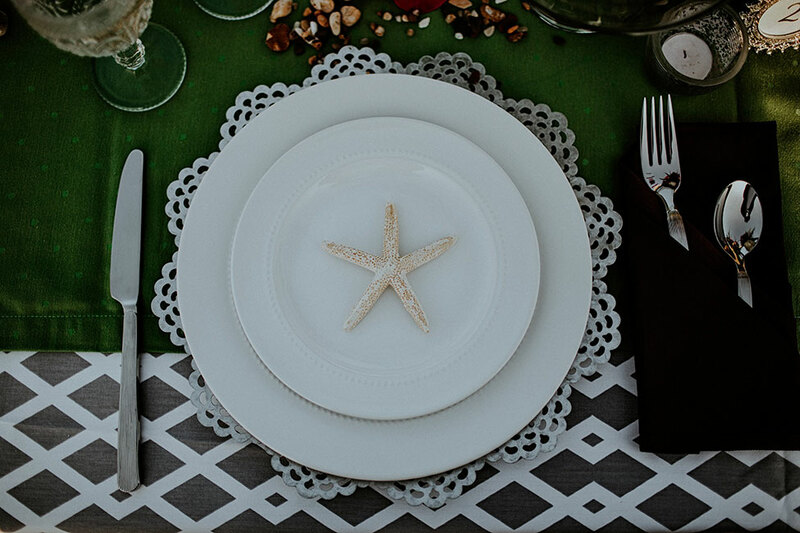 Metallic tin chargers were placed underneath white place settings. 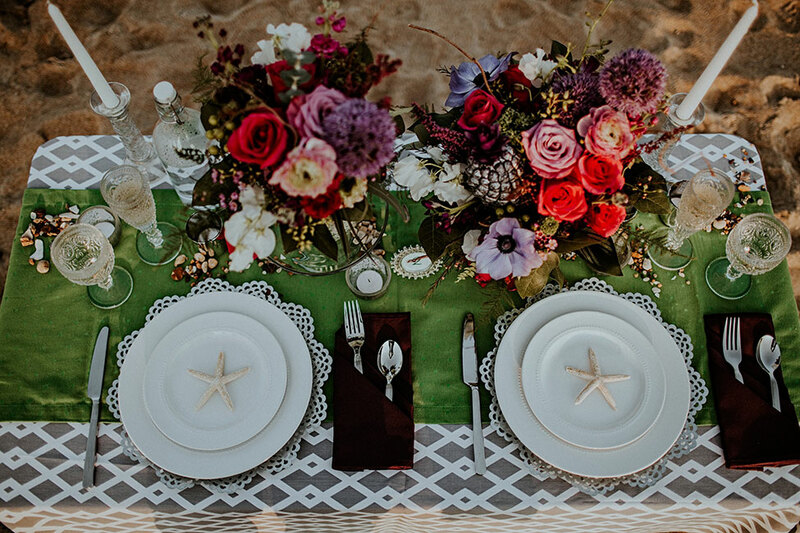 Deep purple napkins coordinated with the floral centerpieces. 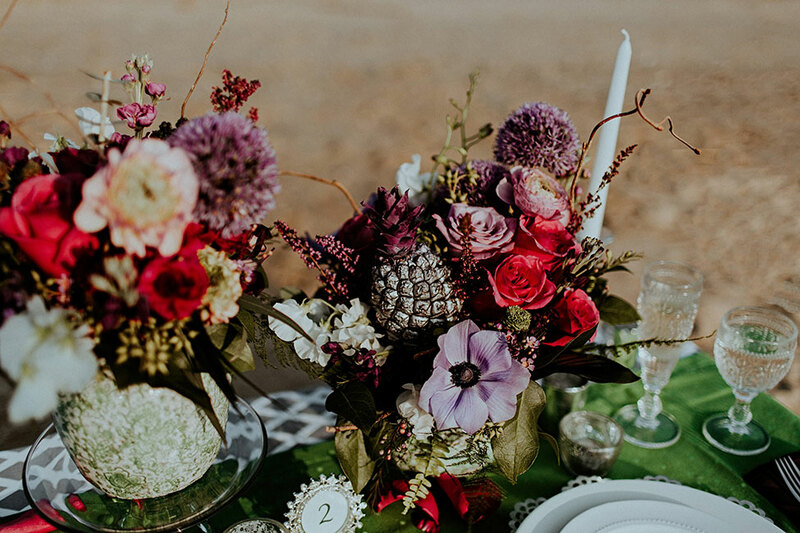 The centerpieces were raised using glass stands that matched the cake stand. 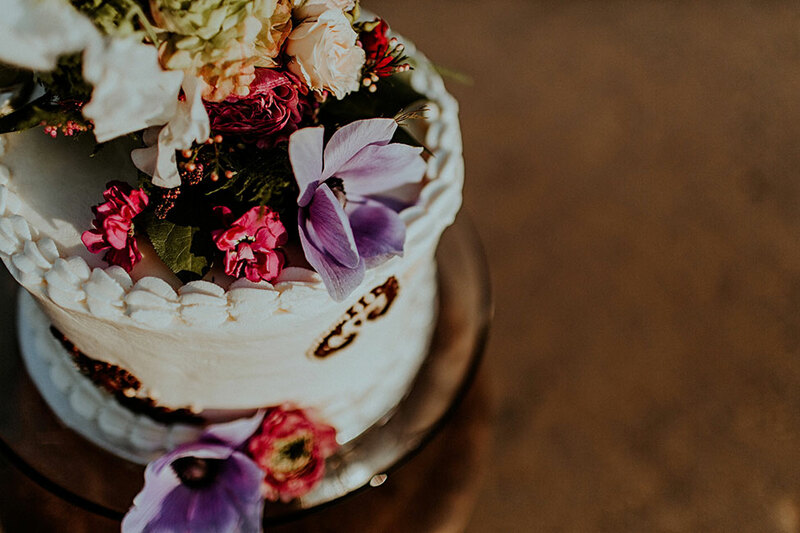 Crystal stemware and candlestick holders were a glamorous addition to the table setting.A tall, single tiered wedding cake by Scratch Made Sweets was perched atop a glass cake stand on an antique piano stool. 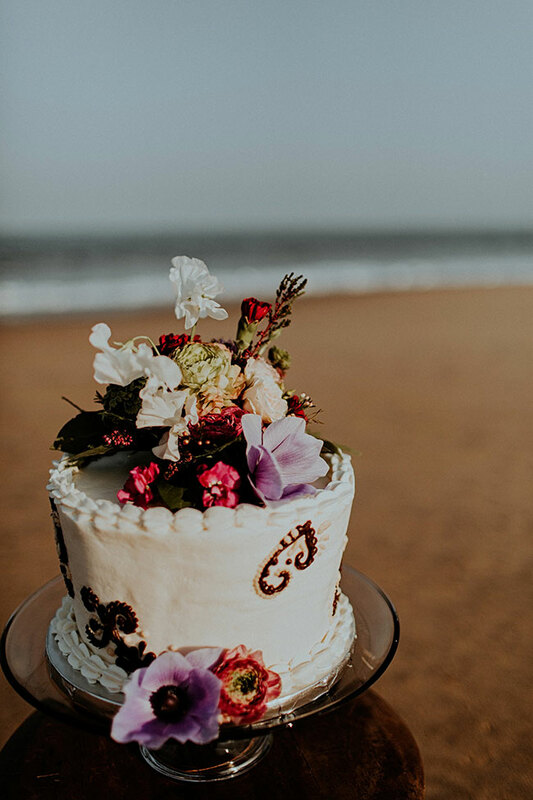 The chocolate and peanut butter cake was iced with butter cream icing. 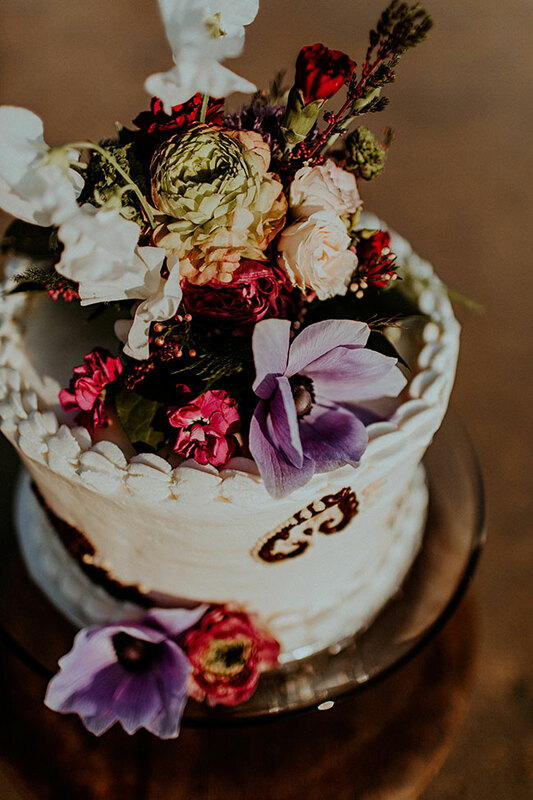 A floral topper and accent flowers were the perfect accessories for the cake.Hand-Painted Weddings of Philadelphia created a beautiful invitation suite that matched the jewel-toned theme. 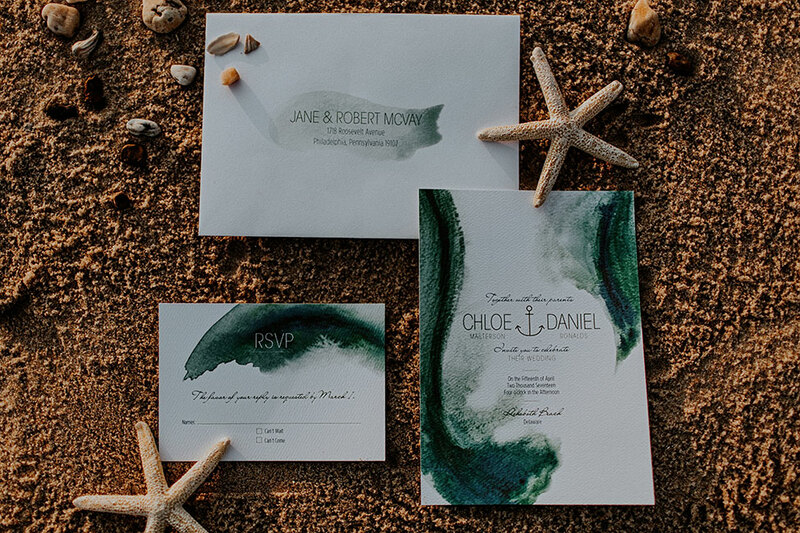 With water-colored designs in emerald green and sapphire blue the invitations mimicked the ocean water.The Hursts’ captured the event perfectly. 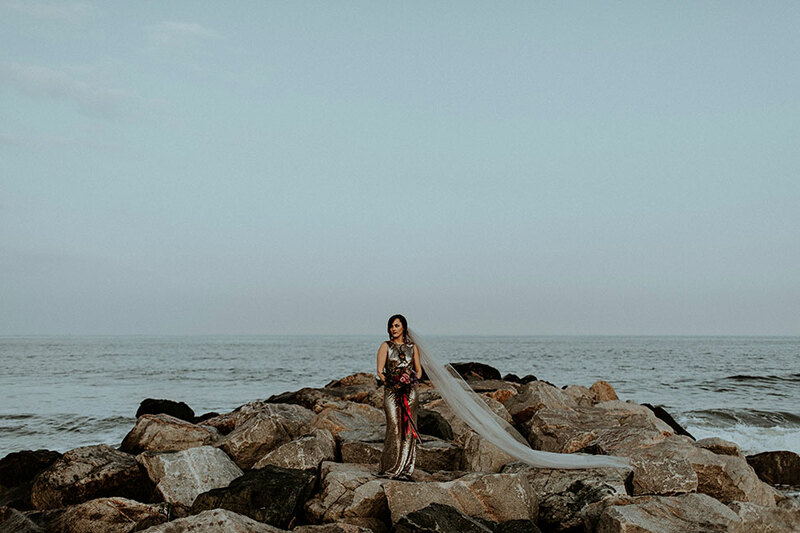 The images are moody, natural and glamorous all at the same time.